Why Would You Volunteer For Next Year's Super Bowl? The Super Bowl is one of the great financial bonanzas of modern times. From the players to the networks to the hotels, everybody involved with it makes a killing. 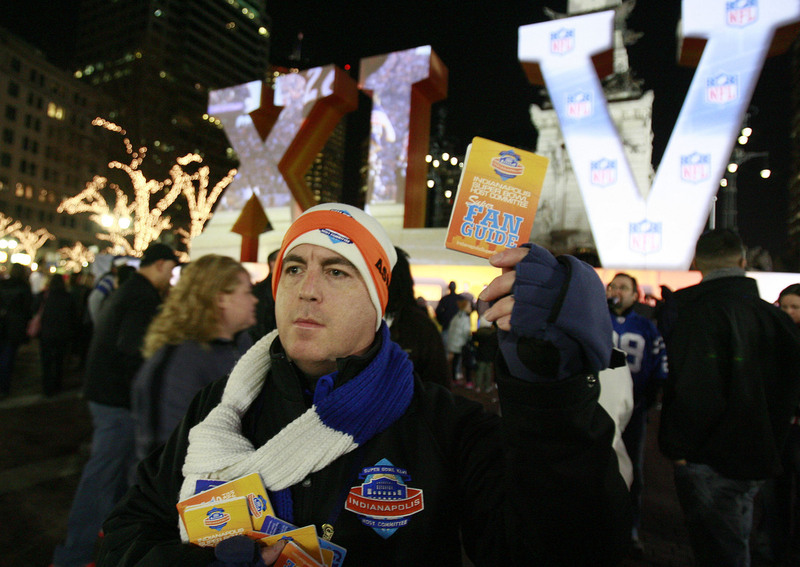 Super Bowl volunteer Ben Schreiber distributes fan guides to any of the thousands of people who may need them while visiting Indianapolis for Super Bowl XLVI festivities, in 2012. Apparently, though, there are more chumps in New Jersey than we see on television's Jersey Shore or hear about in the Rutgers athletic department. I mean, if you want to volunteer, there are so many things that could really use your help. Like hospitals and schools and churches and museums and libraries and all sorts of wonderful charities. Why would anybody volunteer for the Super Bowl? Of course, golf and tennis tournaments, where the players and promoters make hundreds of thousands of dollars, have been getting suckers to volunteer for years. It's amazing how sports seduces us fans. We can take some comfort that it's not just American citizens who are such easy marks. Whole cities and countries throw themselves at sports. Most recently, no doubt you've heard about the riots in Rio de Janeiro, where the Brazilian people are a little put out that while such things as food, medicine and shelter may be hard to come by, the government has put up billions for both the World Cup next summer and the summer Olympics in 2016. The Brazilian sports honorarium pales before what the Russians are laying out for next winter's Olympics, though: a record $50 billion, which is only $38 billion more than the original bid proposal. Sports events always cost a tad more than the officials — who desperately want the event — estimate. And the Olympics and World Cup always lead cities and countries on by saying that the infrastructure built for their games will be a long-term boon for the country. Like Greece, which, as you know, has been living high on the hog ever since Athens overspent for the 2004 Olympics. But, there's always a new sucker somewhere out there. The Olympics and the World Cup scramble to find novel places to go to. Like the 2022 soccer championship will be in Qatar, where it is known to be too hot for soccer. Or next year's Winter Olympics in Sochi, where it seldom gets to be winter. They have stockpiled snow there. All of Russia, suburban Siberia, and they pick a place where you have to save snow? But, if you got the money, the Olympics or the World Cup will only be too happy to come on over and enjoy the facilities you've built just for them. Oh my, what we all do for sports. Why would anybody volunteer to work for free for the Super Bowl?